Need a holder for your favourite incense? Look no further! 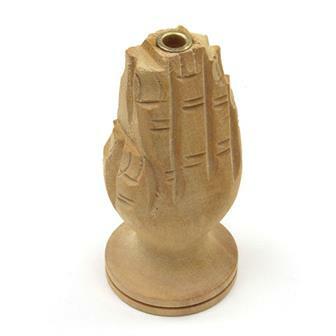 We stock a great range of different incense holders from around the world. They vary from the simple ash catcher styles to the ornate and amazing Thai dragon holders. 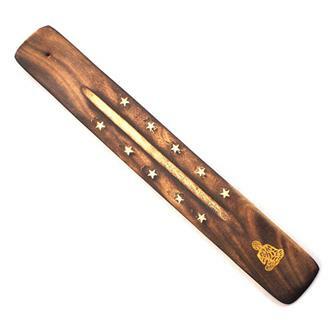 This handmade wooden incense holder has been beautifully engraved with a pattern of two fish swirling. The small central 'bulb' holds a single stick of dhoop incense or stick incense in the smaller sections. 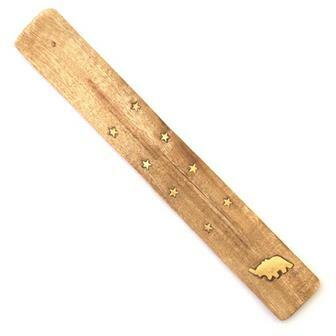 This is our most popular incense holder made from a single piece of yellow wood from Nepal. 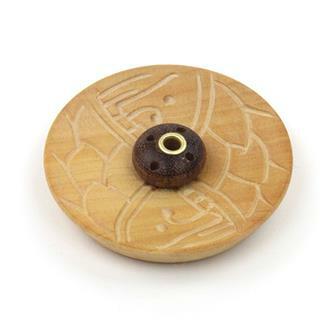 Each holder has been hand carved into a lotus and has a reasonably wide base to catch ash. The lotus shape is recognised as an important symbol in Buddhism. This is one of our most popular incense holders. A piece of wood has been hand sculpted to look like hands joined together in prayer. This intricately carved incense burner holds Tibetan zimpu incense. 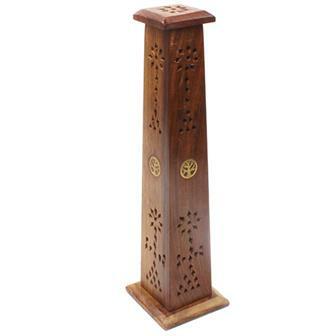 This impressive incense burner has four holes for thin stick incense and a metal disc for burning incense cones. Once the incense is lit, the top can be placed back over the base and aromatic smoke will drift out from the carved holes. These hinged incense smoke boxes have a ridged section for catching ash and two metallic discs for placing incense cones. 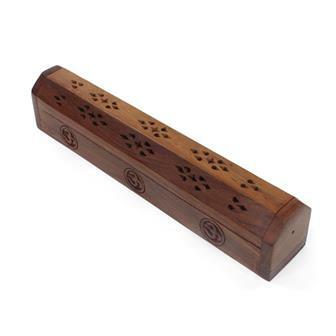 These hinged incense smoke boxes have a ridged section for catching ash and two metallic discs for placing incense cones. 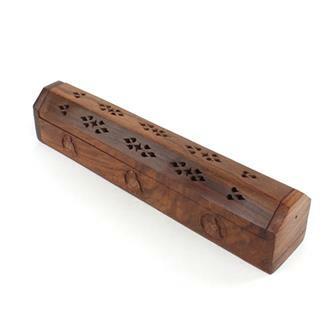 When the lid is closed, the smoke from the lit incense then drifts out from the carved holes. Each box also has a secret compartment for storing your incense. 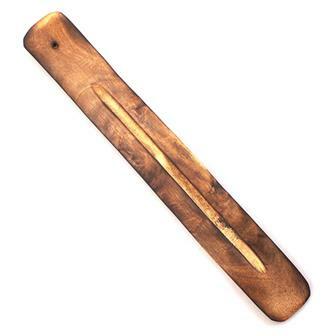 Our most popular style of incense holder to date, this shoe horn shaped, mango wood ash catcher is perfect for use with stick incense, Nag Champa for example. 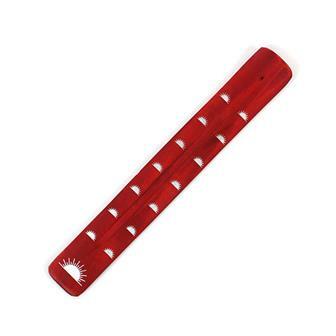 Our most popular incense holder to day, this shoe horn style mango wood ash catcher is perfect for stick incense. This design has been inlaid with stars and a Buddha. 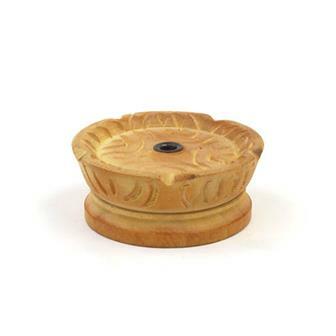 Our most popular style of incense holders to date, this plain wooden ash catcher is perfect for stick incense. This design has been inlaid with a lovely Yin Yang motif and stars. Our most popular styles of incense holder to date, this shoe horn style, mango wood ash catcher is perfect for stick incense. This design has been inlaid with stars and a elephant symbol. Our most popular styles of incense holder to date, this shoe horn style wooden ash catcher is perfect for stick incense. This design has been inlaid with stars and a pentacle symbol. These brightly coloured, shoe horn style ashcatchers are perfect for stick incense. They are decorated with a Buddha motif and come in mixed colours. 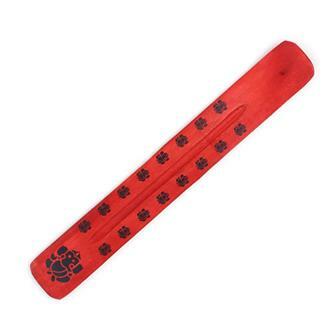 These brightly coloured, shoe horn style ashcatchers are perfect for stick incense. They are decorated with an Om design and come in mixed colours. 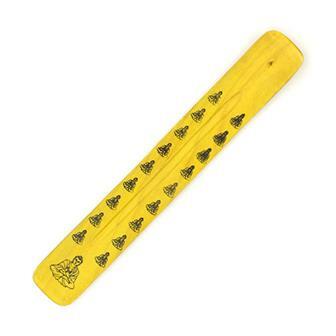 These brightly coloured, shoe horn style ashcatchers are perfect for stick incense. They are decorated with a Ganesh design and come in mixed colours. These brightly coloured, shoe horn style ashcatchers are perfect for stick incense. They are decorated with an elephant design and come in mixed colours. These brightly coloured, shoe horn style ashcatchers are perfect for stick incense. They are decorated with a sun design and come in mixed colours. These brightly coloured, shoe horn style ashcatchers are perfect for stick incense. 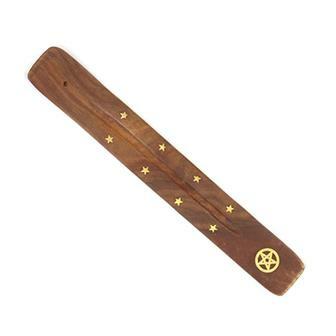 They are decorated with a pentacle design and come in mixed colours. 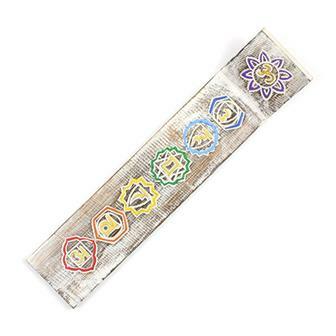 Chunky wooden ashcatcher carved with chakra symbols and painted in a myriad of bright rainbow colours.